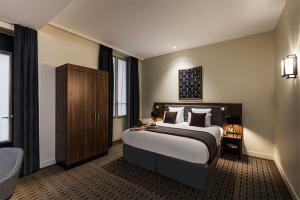 Located in the hip Batignolles neighborhood, The Best Western Premier Kaptial Opera reflects a retro chic vibe. This boutique hotel's 54 stylish rooms feature subtle Art Deco elements along with contemporary comforts including free Wi-Fi, Nespresso® machines and flat-screen TVs. Enjoy a sumptuous breakfast buffet or unwind with a drink at the intimate lounge. Along your path in the hotel, you will cross corridors which resemble art galleries. Located approximately 21.5 miles from Charles de Gaulle airport; Orly Airport is about 17 miles away, and Paris-St. Lazare Station is about a 10-minute walk.